Surrey, B.C. 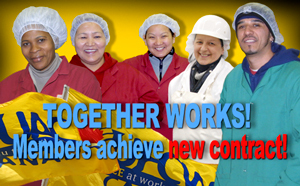 – February 27, 2017 – UFCW Canada Local 1518 members at J & L Beef in Surrey, B.C. have ratified a new five-year, industry-leading collective agreement that includes wage increases, an employer paid pension plan, and more. Over the duration of the contract, members at the top rate of every job in each classification will receive a 2.3% wage increase in each year, while members on the wage scales below will receive a 2% increase annually. All members will receive retroactive pay in terms of wage increases to September 1, 2014. The new collective agreement also includes the addition of a pension plan for members at J & L Beef. Effective March 1, 2017, members will join the UFCW Canada Industry Pension Plan, which will be fully funded by the employer. The contract also features improved language regarding overtime work, including a 30-minute paid lunch after three hours of overtime work, which will be paid at double time. The lunch break is in addition to the 15-minute paid break following two hours of overtime. As well, new language is in place to ensure members receive at least eight hours between shifts and enhances employee's rights to refuse overtime under specific circumstances. Additionally the union has also secured increases in health and welfare benefits, a new safety boot allowance, and an increase to the tool allowance. The union negotiating committee included Gerry Labelle, Narinder Lidder, union representative Tony Evangelista, and Kim Balmer, Local 1518 executive assistant to the President.